Gals put on your best summer chic, put on your dancing Jimmy Choo shoes and get ready for the summer’s hottest cocktail party. Gentlemen, guys - do the best that you can! 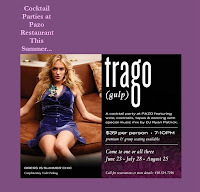 Pazo Restaurant is kicking in for three summertime parties including wine (well of course if the name Trago translates to Gulp), cocktails, tapas and dancing with a hot mix from DJ Ryan Patrick.